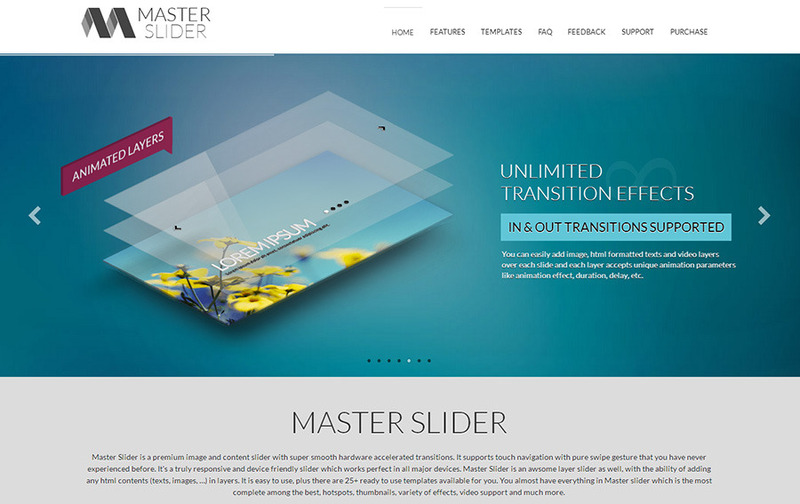 Master Slider jQuery slider plugin is a premium image and content slider with super smooth hardware accelerated transitions. It supports touch navigation with pure swipe gesture, that you have never experienced before. 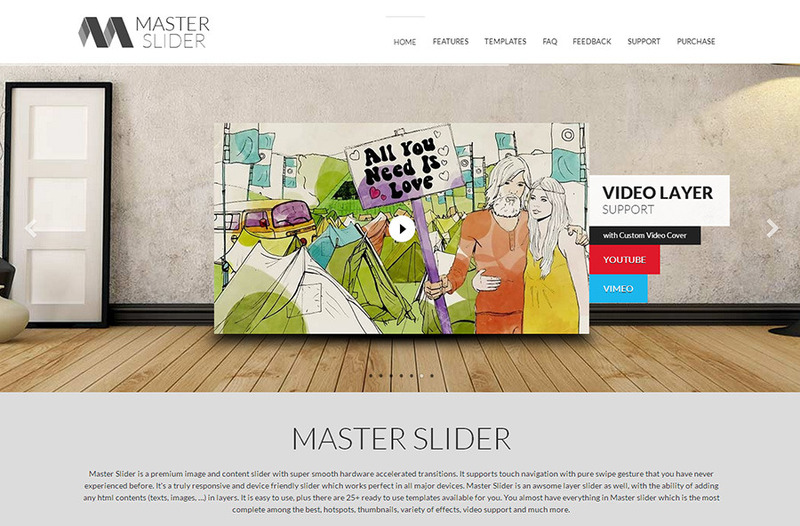 It’s a truly responsive and device friendly slider which works perfect in all major devices. 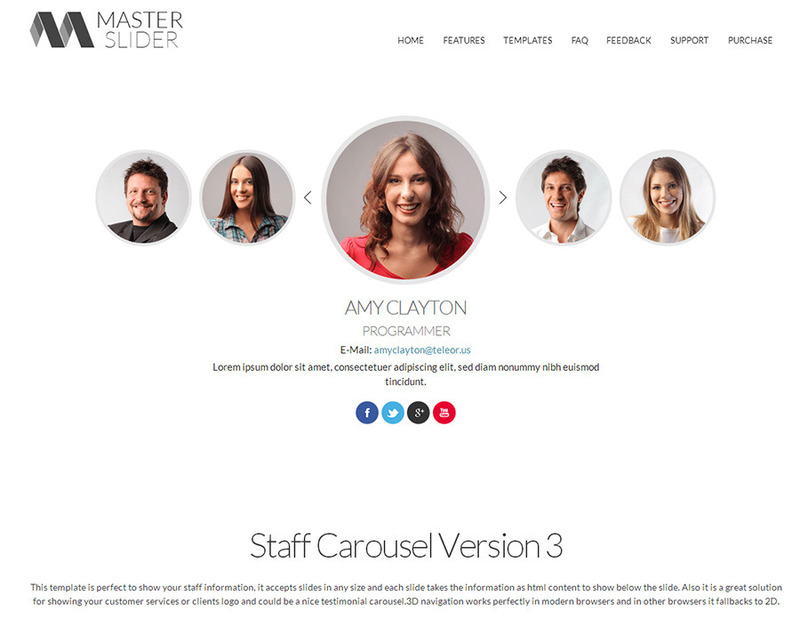 Master Slider plugin is an awesome layer slider as well, with the ability of adding any HTML contents (texts, images, ...) in layers. It is easy to use, plus there are 80+ ready to use sample sliders for you. You have almost everything such as hotspots, thumbnails, video support, variety of effects, and many more features in this plugin. 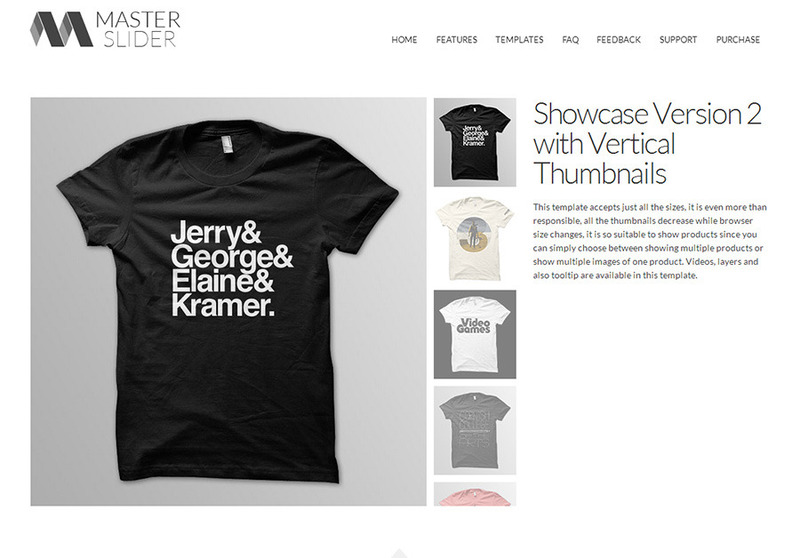 Master slider jQuery slider is the most complete among the best. Visual Builder is a revolutionary facility for our jQuery users. We started a revolution on jQuery slider plugins, and this revolution succeed, because this editor is totally free for our jQuery users.This online tool makes you able to create, manage and export your sliders on averta cloud service. Your sliders are safe in your online panel. It saves you tons of time, while you no longer are required to touch even a line of code. While it is an online service, you don’t receive “Visual Builder” script by your purchase. 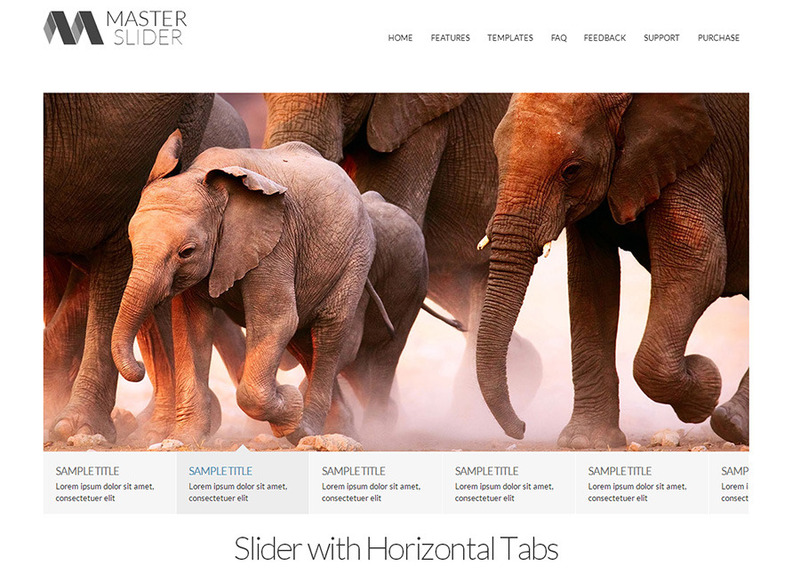 Master Slider jQuery slider plugin provides an easy to use parallax templates that you can use them on your website. These parallax templates let you design your parallax slider in less than ten minutes, by simply using our parallax templates and free jquery visual builder. Parallax slider works smooth on all themes, with any content that you want to use for your slider. 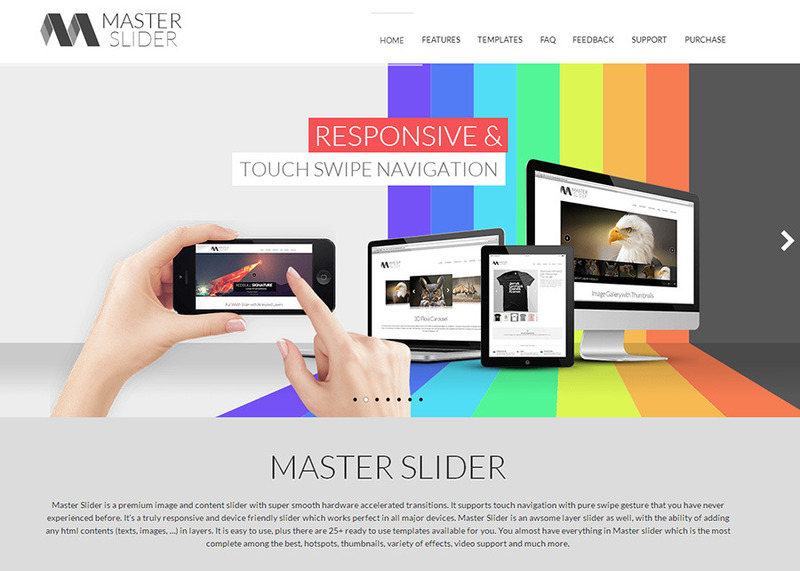 Master slider jQuery slider plugin touch navigation, offers a variety of options like touch swipe on mobile and drag and drop option for desktop. Our touch-enabled media slider allows users to drag over the items smoothly. Master Slider is one of the easiest plugins on Envato marketplace, which also greatly extends functionality into touch-support mobile devices. Video gallery is one of the most important tools for business owners to promote their service or product. 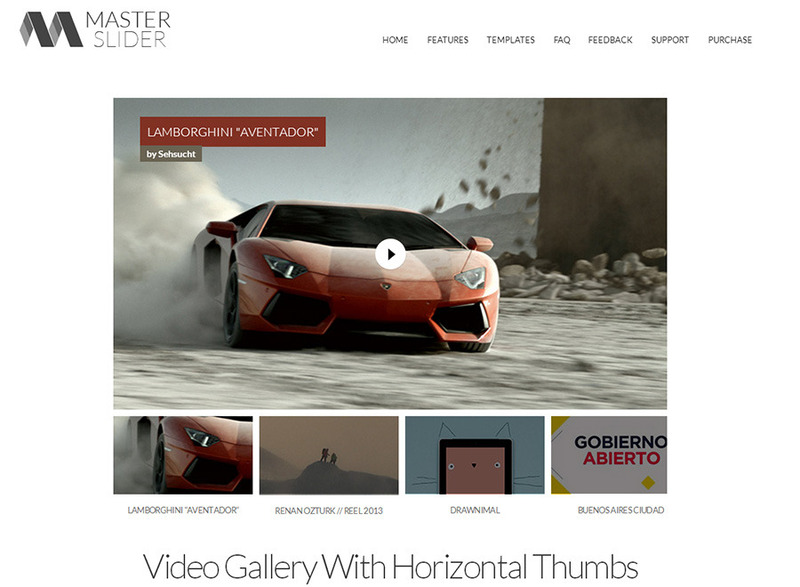 Master Slider jQuery slider plugin allows users to create stunning Youtube and Vimeo sliders for their website. 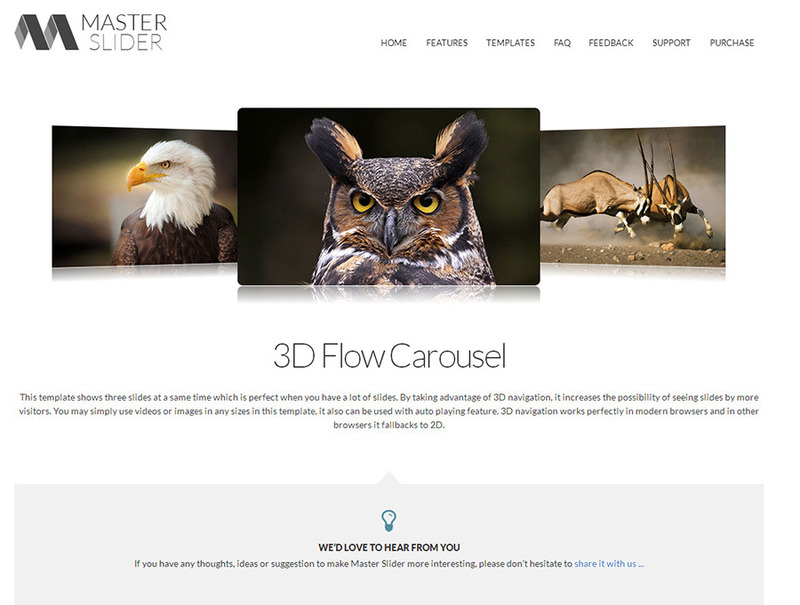 With Master Slider ready to use video templates, you can create elegant video gallery just in minutes. The best plugin on Envato marketplace to create Youtube slider, is Master Slider jQuery slider plugin. All you need is to choose one of our Youtube video slider templates and embed the link of Youtube video. Creating Master Slider Youtube Slider, is one of the most easy way to get more traffic and shares for your website. 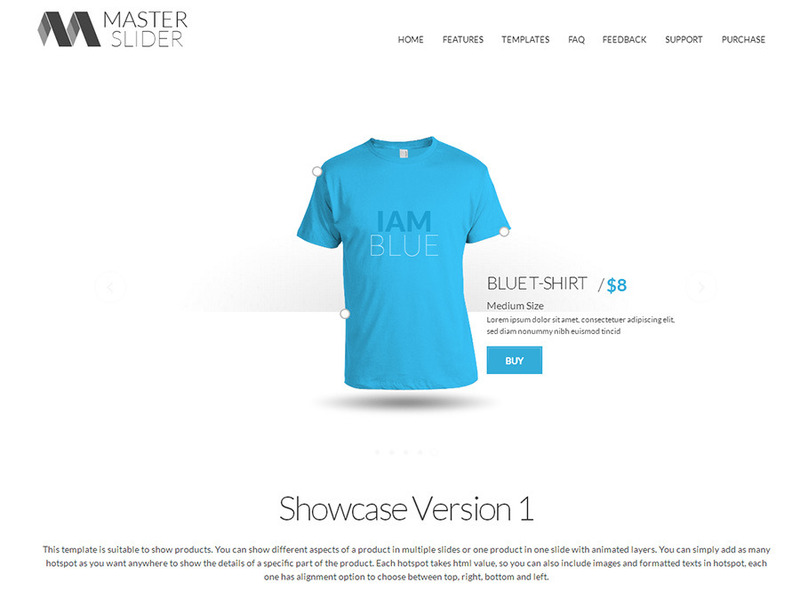 Master Slider jQuery layered slider plugin has different layers with amazing options. They are five editable layers you can add to your slides: Text layer, image layer, video layer, button layer, and hotspot layer. You can customize each layer’s content, style, transition, and misc. Each layer can be animated, too! With animated layers, you can insert or embed HTML formatted texts, links, images, and videos directly into your slides and add unique animation parameter such as effect, duration, delay, etc. 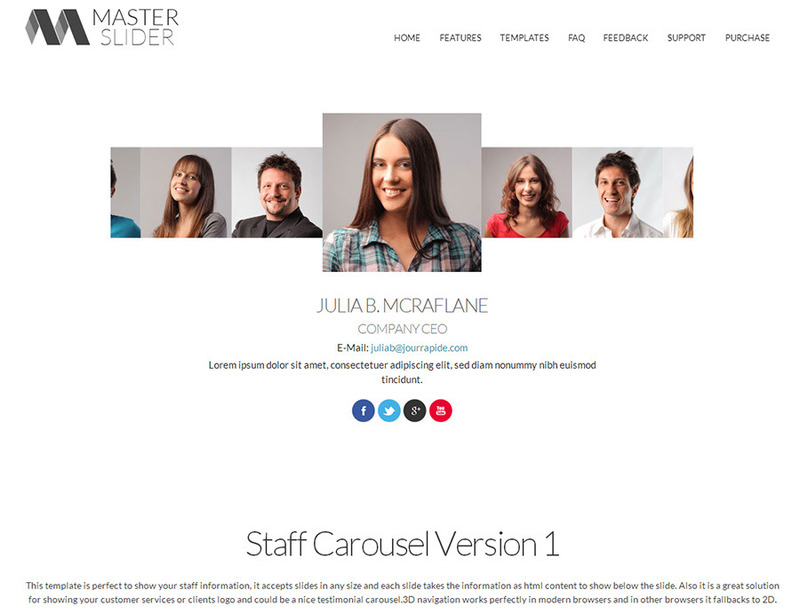 You can create image and content slider with Master Slider jQuery slider plugin. Any content can be added to the slider. 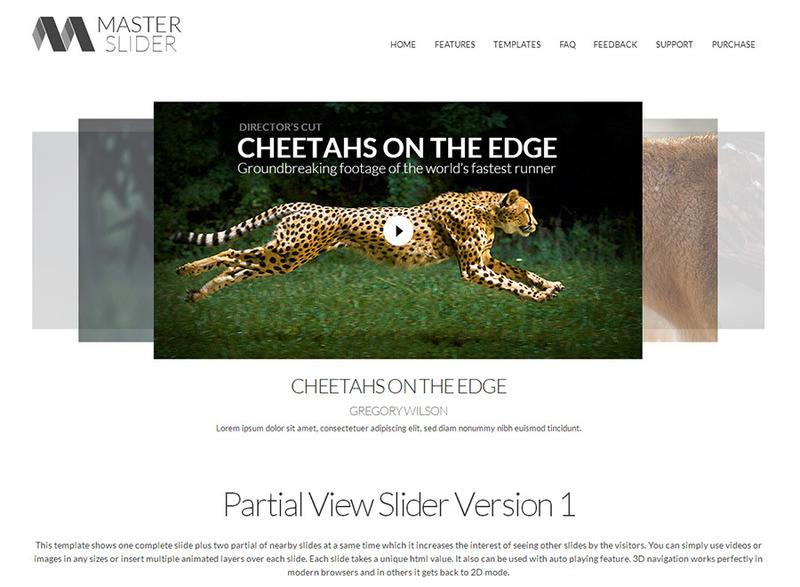 Master Slider awesome features help you easily add images and other content and customize them in any way you wish. You can add transition or style to the added content. However, you are able to only have an image slider. Images simply can be added to the slider, from media library. Just easily choose images one by one, or select multiple images. Also, all slides’ images can be enlarged in lightbox. There are different image services, and instead of uploading the same images you have already used there, it is easier to get your images automatically from these websites and show them on your website. 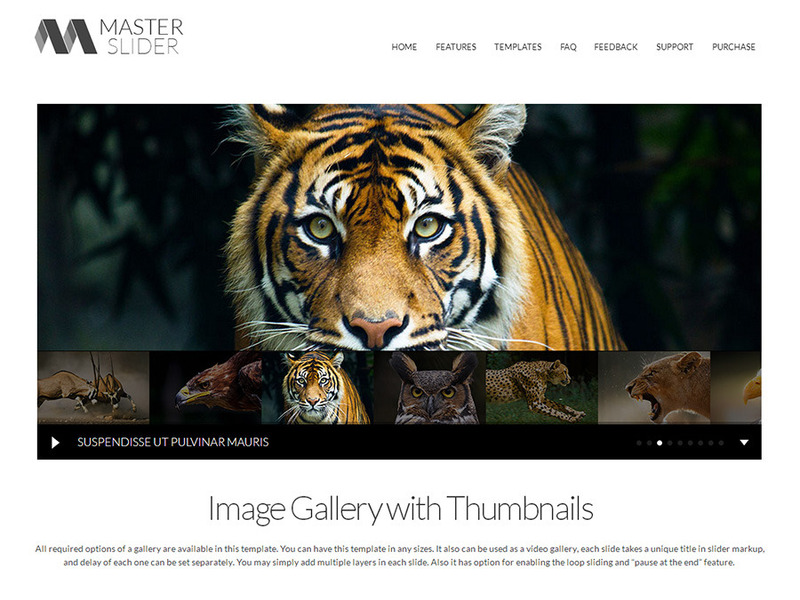 Master Slider jQuery slider plugin integrates with Flickr and lets you create a slider by your Flickr images. Your latest Flickr images will appear on a slider, with or without author name, image title, and image description as a text layer on the slides. - [Added] Overlay layers, now you can add animated layers over the slider too. - [Added] Masked layer, this feature gives you the ability of masking layers to achieve fresh looking animations. - [Added] Smart layer actions, now it is possible to add "show layer", "hide layer" or "toggle layer" actions to the layers. - [Added] New minimal slider skin. 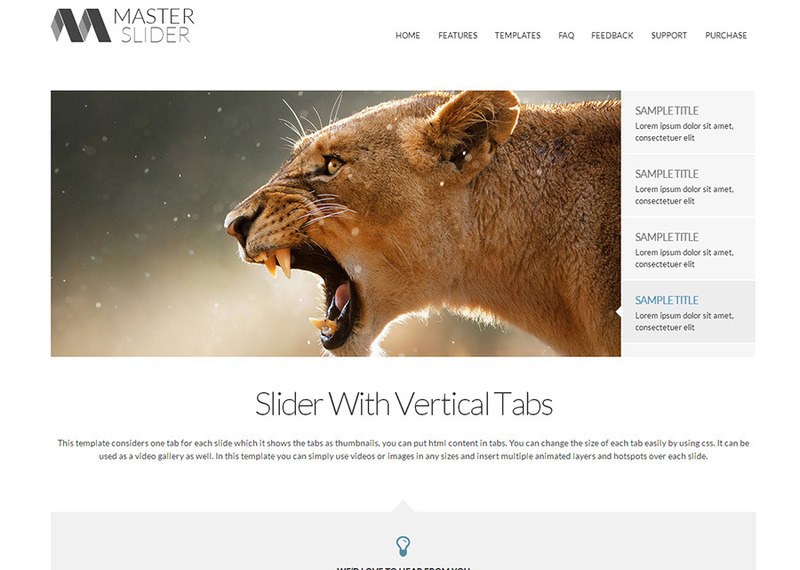 - [Added] New slider sample as the example of new features. - [Added] Option of enabling background video in mobile devices. - [Fixed] Static layers positioning in Firefox. - [Improved] Layer animations and show/hide timing functionality. - [Added] Box transition view. - [Fixed] An issue of getting touch JS error in some Android devices. - [Improved] Swipe sensitivity while scrolling page on touch devices. - [Improved] Slider stability in some pages which contained JS errors from third-party scripts. - [Updated] Updated Prettyphoto script version to 3.1.6. - [Fixed] Hotspot layer custom attributes didn't work. - [Added] Flickr and Facebook gallery templates. - [Added] `scrolTo(duration, target)` layer action. - [Improved] Slider sizing with autofill or fullscreen layout. - [Fixed] Controls auto hide didnt work in touch devices. - [Fixed] Scroll parallax effect did not work. - [Fixed] Preload value larger than slides number caused js errors. - [Added] CSS3 filters option, now you can add css filters to slider transitions like grayscale, blur, ..
- [Added] Stack slide transition view. - [Added] New template for Fixed layers. - [Added] New template for Static layers. - [Added] New template for Stack transition view. - [Added] New template for CSS3 filters option. - [Added] Change on hover option to thumblist control. - [Added] Arrows style for the thumblist control. - [Improved] startOnAppear option functionality. - [Fixed] A conflict with startOnAppear in Facebook gallery. - [Fixed] An issue in calculating thumbnails width. - [Fixed] An issue in aligning thumbnails which doesn't have fillMode option. - [Added] startOnAppear option to slider. It initializes slider when slider comes inside of browser window when scrolling. - [Improved] API update method. - [Fixed] Some minor js errors. - [Fixed] Throwing error after destroying slider with API destroy method. - [Fixed] A JS error in IE9. - [Fixed] Rendering issue in Firefox. - [Fixed] Mouse wheel not working in latest version of Firefox. - [Fixed] Missing map file. - [Fixed] Partial view version 2 not working. - [Fixed] Image layers over first slider not aligning correctly in Chrome for iOS. - [Improved] Gallery template style. - [Improved] Slide linking. Now it's possible to add lightbox to slides. - [Fixed] Linked slides not working correctly. - [Fixed] Problems with 3D transitions in FireFox. - [Fixed] Video background paused in "mask" transition view when window resized. - [Improved] Lots of improvement in slider performance. - Added new transition view "parallaxMask". - Added new direction styles to tab's arrow (left and top). - Improved wheel navigation by Magic Mouse or Trackpad in OS X. - Improved parallax effect by mouse movement. - Fixed links and buttons not working with "mask" transition. - Fixed instant start layers and load nearby preloading conflict. - Fixed wheel navigation with non-loop slider. - Fixed unexpected horizontal page scroll bar when fullscreen is enabled. - Fixed unexpected js errors when swipe navigation is disabled. - Fixed not showing layers with "with-limit" attribute when window resizes. - Updated slider base style. - Added deep linking feature. - Added vertical direction to bullets UI control. - Added option to disable swipe over layers, now it's possible to insert HTML form elements over slides. - Improved slider UI controls responsiveness. - Fixed an issue with fullscreen slider in IE8. - Fixed an issue with playing/pausing Youtube and Vimeo videos in some browsers. - Added parallax scroll effect. 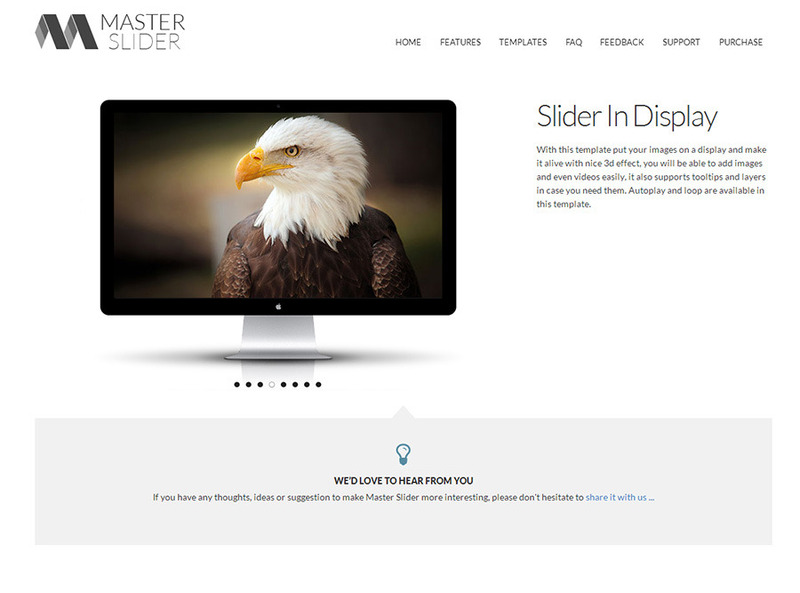 - Added jQuery plugin setup method, now you can use Master Slider jQueyr plugin to setup the slider. - Added autoplay option to video layer and slide video. - Fixed conflict with an old version of jQuery UI. - Added new layer type for adding buttons to slides. - Fixed an issue with Flickr API. - Added content slider feature, now you can add any html content in an auto height slider. - Added fixed layer positioning option. - Added touch events for desktop IE11 browser. - Added option to enable mouse over hotspot's tooltips. - Fixed aligning layers in blank slide. - Fixed video layer sizing issue. - Fixed z-sorting issue in 3D transition views. - Fixed an issue with autoplay slider and video background slides. - Added new option "layout", now you can change layout of slider (fullwidth, fullscreen, partial, boxed, ...) by one option in slider options. - Added links for hotspots. - Added new option "instantStartLayers" which starts layer before slide transition complete. - Added new destroy method with reset parameter. - Added "align" and "margin" options to thumblist, sliderinfo, scrollbar, bullets and timebar controls. - Added new option "hideUnder" to controls, now you can specify window width in pixel for each control and hides control in smaller window size. - Added thumb width and height and space between thumbs options to thumblist control. - Added "color" option to scrollbar and timebar control. - Added Ajax sample in download package. - Fixed auto height slider resizing. - Improved slide changing transition. - Fixed accessing to slider api before slider init. - Fixed background sizing problem with not cached images. - Added HD background videos. 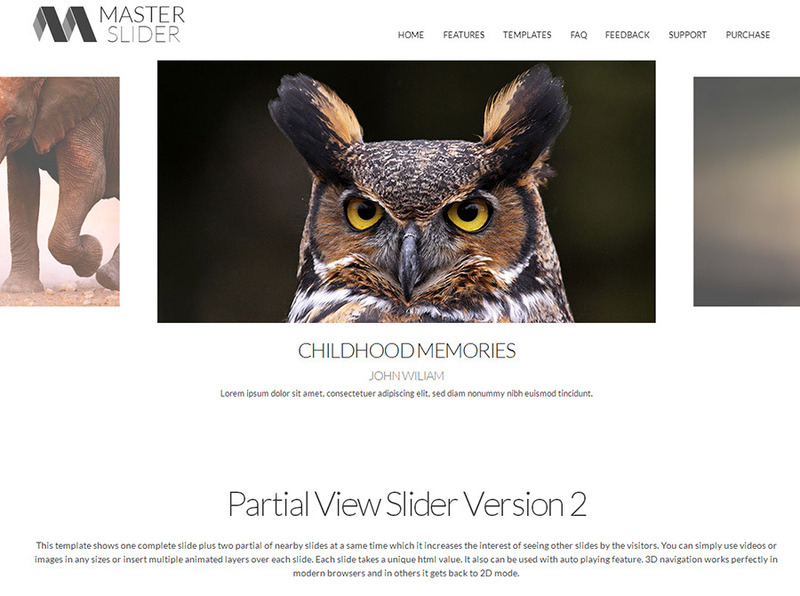 - Added Masterslider's homepage slider in download package. - Added smart memory management, now slider works with over 150 slides. - Added dynamic speed to swipe gesture. - Added update method in slider API. - Fixed tooltip positioning in Firefox and Opera. - Fixed video close button in touch devices. - Fixed layers z-sorting in Safari. - Fixed video cover image positioning. - Added scrolling speed option to thumbnails/tabs UI control. - Fixed positioning of tooltips in mobile and tablet view.